‘Untitled XII (no.3)’ belongs to a monumental group of four related works (‘Untitled XII’) that were born out of a moment of abstraction. As Gursky was reading, his eyes lost their direct and intimate connection with the page. This moment and the experience led him to choose the Austrian writer Robert Musil’s sprawling unfinished novel ‘The man without qualities’ (1923–42) as the basis for ‘Untitled XII’. He scrambled the text, had it typeset and made into a book, which he then photographed. 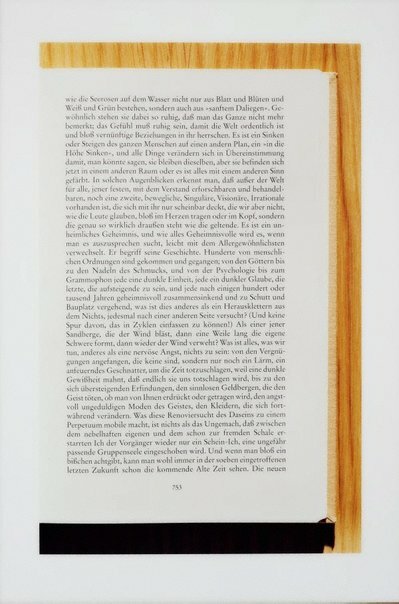 The text is readable, evocative and ultimately meaningless; it functions as a grid with the edges of the page and the book cover operating as a series of minimal objects, one on top of each other. The lighting appears to be entirely uniform, however the flat surface and the various layers are underlined by a black shadow at the bottom. Gursky usually titles his photographs according to their location, but the ‘Untitled’ series, which began in 1993 when Gursky photographed a stretch of grey carpet, is very specific in relation to the perceptual and thinking processes. Signed l.r. certificate of authenticity, blue ink "Andreas Gursky". Not dated. John Kaldor family collection: Art Gallery of New South Wales , Sydney, 2011, 236, 245 (colour illus. ).